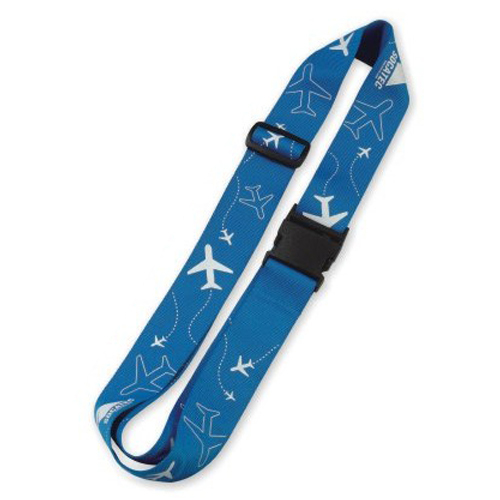 Help your customers escape on the holiday of a lifetime, and promote your business around the world with the branded Polyester Luggage Strap from EzyLanyards. If you’re business is travel, you need a solid promotional tool; you can’t go past a well printed, durable and bright luggage strap to help promote your brand, business and services. The Polyester Luggage Strap from EzyLanyards is available is a great range of colours and comes in a size of 1800mm x 50mm; with the ability to fit around plenty of suitcase sizes, your customers will love being able to easily identify their luggage at the baggage carousel. With an adjustable buckle, and the option to add a combination lock for extra security, these luggage straps can be used as promotional gifts when a customer books travel with you, or as promotional merchandise to be sold in store at the airport or online. Perhaps your business isn’t in the travel industry but you’ve always got staff flying to other sites or interstate and internationally visiting other branches. These luggage straps are a great way to promote your business around the country or the world, all while ensuring your staff can easily identify their luggage and be on their way quickly and efficiently. Whether your business is travel, or you just travel a lot for business, a promotional Polyester Luggage Strap from EzyLanyards is a great way to promote your business, and ensure your customers or staff are on their way to enjoying their trip. Help your customers cut down on lost time or picking up incorrect luggage with a branded Polyester Luggage Strap.